CHICAGO, IL. — Former NBA legend and business entrepreneur, Earwin “Magic” Johnson, will be the keynote speaker at the 2014 National Restaurant Association’s annual trade show scheduled for this coming May. Johnson’s keynote address will be held at 2 p.m. in McCormick Place’s Grand Ballroom on May 18. Doors open at 1:30 p.m. The keynote address is open to all registered NRA Show 2014 attendees, exhibitors and media, and seating is on a first-come, first-served basis. The annual National Restaurant Association Restaurant, Hotel-Motel Show is the largest annual gathering of restaurant, food service and lodging professionals in the world. Photo shows Magic Johnson speaking n Feb 2014 with The Breakfast Club. 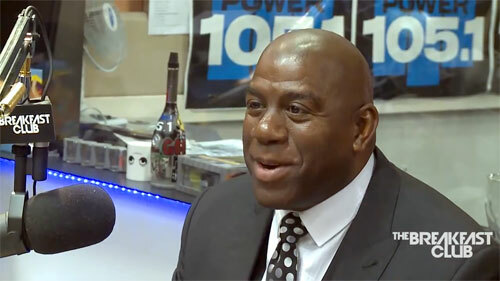 Magic” Johnson was selected by the Los Angeles Lakers as the first overall pick of the 1979 NBA Draft and played for the Lakers for 13 years, during which time he enjoyed five NBA Championships, three MVP awards and 12 All-Star designations. He was part of the 1992 U.S. Olympic Basketball team that won the Gold Medal in Barcelona and returned to the Lakers as coach for the 1994 season. If you would like to book sports legends like Magic Johnson for an event, contact Magic Johnson’s booking agent for appearance & speaker fees.